In a black & white world you'll either have positive approach or a negative approach to feeling down. The key is to be aware of your approach and gradually change it to being more and more positive. It's a very powerful way of increasing your mental health and being in control of your own mood and to a certain extent: being in control of your own "downs"
Another one of the very highlights of this summer has been our involvement in some of the annual music, culture & lifestyle festivals which New Zealand is so famous of. Every summer, Kiwis and visitors gather for festivals of all sizes and in all regions of the country. Whether your heart beats for food, music, wine, dance, spirituality or local Maori culture rest assured there's a festival here you'll love. I've had the opportunity to learn a lot about the basics of TCM right here in little old Shanghai. It has opened up a whole new world of understanding my body, health, balance, and food. Its worth learning a bit about TCM while you live in Shanghai (or anywhere actually) and learn some vital things about your body & health - knowledge which you can take with you when you leave Shanghai and to wherever life may lead you. Shanghaihabits is now Shantihabits - reborn as a blog less focused on Shanghai and more focused on physical, mental & spiritual health... more Natural Goodness, more Yoga Asanas and more OM chanting! yaaay. Oh and of course lots of traveling and adventures as always! A very Merry Christmas from Leon's family home in New Zealand: Mount Maunganui. This year I'm having a warmer, a brighter and a very different Christmas than what I'm use to. But what it doesn't have of Danish traditions, it certainly has in color - an amazing Christmas mix of Swedish, American, Kiwi & Danish. No matter where in the world we have our everyday life it just seems like it, everyday life, takes over. We have these good intentions of being happier, of being healthier and of doing more stuff with our friends and family but most days we end up too busy, too stressed, too overwhelmed. It can so easily feel like we don't have the control at all and days as well as life just "happens to us". We need more "Zen" and in my opinion we should all add a spiritual dimension to our life. So here I am: in paradise, surrounded by the most friendly and interesting personalities, learning about & practicing my passion from 6.30 morning to 7.30 evening every day and being taught and guided by inspiring yogis from Mysore in India. Yes as you can read between the lines, it's amazing. Once again, I'm just about to take off from my beloved Shanghai. It's time for another break from the big city and it's time to get my Yoga Teaching Certificate! If someone would have told me this one year ago I wouldn't have believed them. I still don't quite believe it but tomorrow it becomes reality when I land in Indonesia to get straight into intense Ashtanga Yoga Practice at the Kura Kura Yoga Retreat in south of Bali. It's winter, it's cold and it's dark (but if you think Shanghai is dark you should experience winter in Denmark and the northern countries - some days it doesn't get light'ish until 9.30 and it starts getting dark already at 2pm again...). Cold & dark December was bearable because it is such a cozy month! Everyone is getting in Christmas mood or at least trying to which includes lots of fun, food, drinks & "hygge" (a form of coziness in Danish, our no. 1 Christmas word). But after Christmas days and New Year's fun comes January. What's left is the coldness & the darkness and what seems like some really long weeks and months lying ahead. All the things we exaggerated with in December now needs to be minimized whether its spending, smoking, drinking, eating or being lazy! Waaaa, is this just a sad sad month ma? Well, it can be. Or not.... How can we create some light, some comfort & not least some excitement in this first month of the year? My two point of focuses for the new year are: Yoga & China. I want to focus on Yoga. I dream about taking a teacher training course on an exotic island, preferably later this year. But before I do so I want to have taken my daily practice to a high level and proven to myself that I really want it and that it's not just an "escape from evil everyday life and reality". Since I started my new, very exciting & very busy job in September my daily yoga practice have been limited to a 2-3 days a week practice. Which is acceptable, I'm only human. But then December busyness came which resulted in an absolute minimum of training, followed by holiday in Denmark where I don't even have a yoga mat... (oh hello excuses). Let's just say I ended 2014 with the feeling that my incredible yoga progress had been absolutely stopped.... or paused I mean, because now it's a new year and January is my opportunity to get back into daily practice. January is my new best friend! I also want to focus on China. Though I don't know how long time I have left in this fascinating country, I do know that my time is limited (next stop: nature, fresh air & clean ocean) so I want to make the absolute most of it in 2015. I want to travel more & I want to learn more. To kick-start January I've kick-started my yoga practice from day 1 back in Shanghai. Even when it's too dark, too cold & I think I'm too tired I plan to practice before work. My favorite motivation in regards to yoga, running, learning Chinese etc. is to tell myself: it is not easy, if it was easy the whole world would do handstands, run marathons, speak Chinese & move mountains. But they don't. Because it's not easy. It's hard work to learn, to grow, to progress, to do something new & different and to become stronger both physically and mentally. But it is worth it and we only live once so get up and get started (okay a bit dramatic but it works when I'm lying in my warm bed at 6.30 and the alarm clock kicks in). To make January better I find that I need something to look forward to. I also need some concrete plans for my intention of focusing more on China. A perfect solution to both these "issues" seems to be: traaaaavel plaaaans. So, I have decided to travel out of Shanghai at least once every month this year and first to go is my best friend January. Exciiiiting! It's even more exciting that my January plans have already been made. 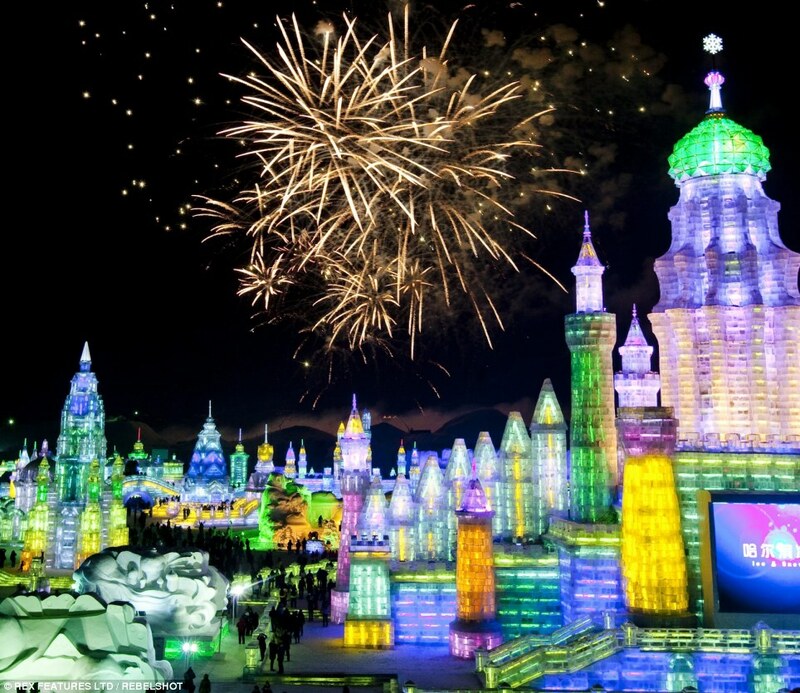 It will be on my birthday and this trip will be to Harbin, the famous Ice Festival City in North East China. Hopefully I will celebrate my birthday in a whole new world made out of ice and get to see a Siberian Tiger Baby.... Check out more about Harbin here. I'm definitely super excited about January & the new year and all the challenges, rewards & magical things it will bring.